re-apply during the session. The balance of specially selected ingredients leave the body & sole feeling nourished. 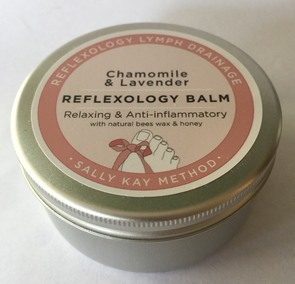 Chamomile & Lavender has both relaxing and anti-inflammatory properties. Chamomile & Lavender has a gentle relaxing and soporific effect on the mind. Chamomile is harmonising, peaceful and soothing to the spirit, it can be beneficial for sensitive skin. Lavender is well known for its many therapeutic properties and actions, including a harmonising effect on the nervous system, relief of muscular aches and pains and it is commonly associated with preventing infection and promoting rapid healing of the skin. Lavender enjoys the status of being the most popular and versatile essential oil on aromatherapy. Chamomile & Lavender Ingredients: Helianthus Annuus (Sunflower oil), Cocus nucifera (Coconut oil), Buxus chinensis (Jojoba oil), Cera alba (Beeswax), Mel (Honey), Chamomile (Anthemis nobilis), Lavender (Lavandula augustifolia), Vitamin E, Citral, Geraniol, Limonene, Linalool.